2Lt. William Montague Nicholls, Class of 1912. This was truly frustrating me and causing me many sleepless nights. I want there to be a face for every Citadel Man interred or memorialized in the military cemeteries of Europe and North Africa, and I want their stories to be told. All the headstones and memorials are beautiful, but they are cold, hard, identical, and overwhelming in numbers. With a photo, each name chiseled into marble, becomes a man, flesh and blood, each with his own unique character and story. Looking into the faces of these men, I often find myself asking, “God, why did you take him?” “He was too young.” “He was a father.” “He was an only son.” “He was a brother.” By seeking out and pulling together their stories, I am learning of their deeds and their nicknames. I am coming to know them in a personal way, and I shall remember them. Thus, I persisted, driven in my search, and I am extremely pleased to say that a few days ago I located not only W. Montague Nicholls’ portrait but his entire senior write-up in the Naval Academy’s yearbook. Photo source: 1914 Lucky Bag, US Naval Academy, Annapolis, Maryland, p. 158. Photo courtesy of The Nimitz Library, US Naval Academy. Click on photo to enlarge. Montague received an appointment to Annapolis during his second year at The Citadel. 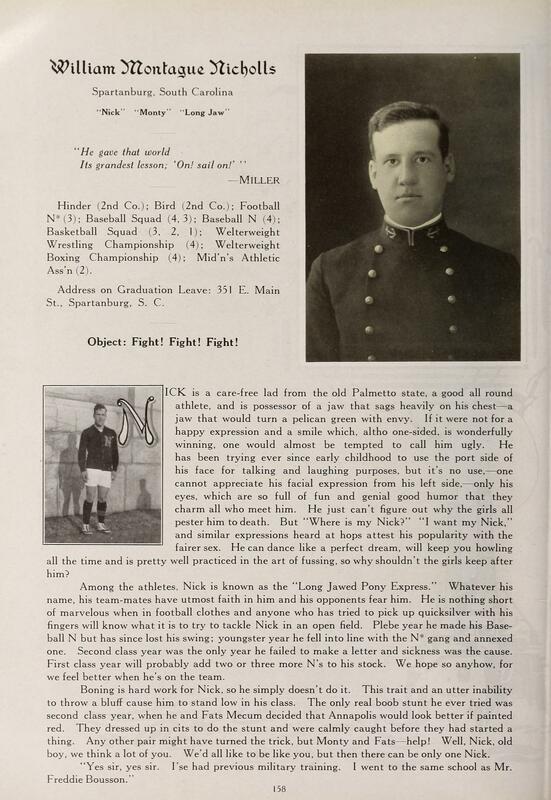 He was honorably discharged from the South Carolina Corps of Cadets after his sophomore year and entered the Academy with the Class of 1914 at the beginning of the 1910-1911 academic year. He did well at the Academy, especially in athletics, but left the school just six weeks before graduation. Several months later he found himself pulled towards the European war. In England he joined a volunteer regiment and soon was taken into the regular Army and commissioned a second lieutenant in the Royal Field Artillery. Just a little over a year after arriving in Europe, he was killed during the British offensive at Loos, France, September 26, 1915. His name is now memorialized on the Loos Memorial, Dud Corner Cemetery, Loos-en-Gohelle, France. Details, including an obituary printed in The Spartanburg Herald, are on his In Memoriam page. Of the 52 Citadel Men interred and memorialized in Europe and North Africa, only 1Lt. William Allsbrook Mulloy, Class of 1909, who rests in peace at Somme American Cemetery, Bony, France, does not yet have a picture or portrait with which to be remember. William was from Cheraw, South Carolina, and I would be very grateful if someone could help me locate a photo of him and more information about his life. It will be found. Of that I am sure. Now that I have put a face with the name “W. Montague Nicholls”, I will, like a bulldog, tenaciously do the same for Lt. Mulloy. This entry was posted on April 4, 2013 by Roger Long. It was filed under France, Loos, Uncategorized and was tagged with Battle of Loos, Citadel Men, History, Loos Memorial, Naval Academy, Royal Field Artillery, Spartanburg SC, sports, The Citadel, WWI. Excellent show, Roger! The only way we are able to reassemble our history and heritage is through persistent effort. The rewards for you lie in knowing you have preserved what could have been forever lost. To me this is the most important reason for participating in The Citadel Memorial Europe Foundation: a story and a face for every name! Congratulations, you are getting close to having secured every Citadel man’s identity! I hope one day we will be able to say the same about all the men buried overseas in the Henri-Chapelle American Cemetery, Belgium. Tenacity, perseverance, determination, respect and gratitude …. are the ingredients. Caroline, thank you so much for your note and the work you are doing there at Henri-Chapelle. Your ingredients are absolutely spot on.